Indiana County Camp Cadet takes place at Camp Seph Mack in Penn Run (Cherryhill Township, Indiana County), Pennsylvania. The Laurel Highlands Council of Boy Scouts of America operate Camp Seph Mack, which is located at Yellow Creek State Park. 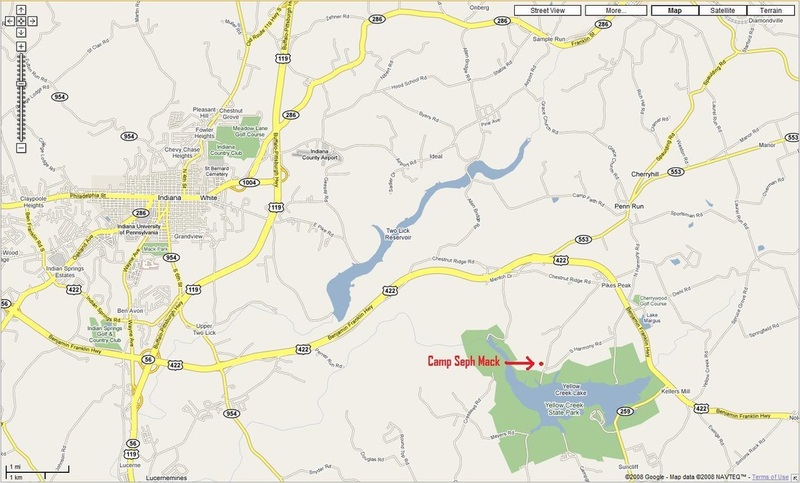 Camp Seph Mack is an ideal location for Indiana County Camp Cadet. For more information on Camp Seph Mack and the Boy Scouts of America, please visit the following links. Follow SR 422 east from Indiana. Shortly after the four-lane road ends, you will see Pike’s Peak Nursery on the left. At the next intersection, make a right onto South Harmony Road (at Four C’s ice cream shop). Stay on South Harmony Road and follow the signs for the Boy Scout Camp. When you see the large Boy Scout Camp (Camp Seph Mack) sign you will turn right onto the gravel road which leads to the public parking area for the camp.